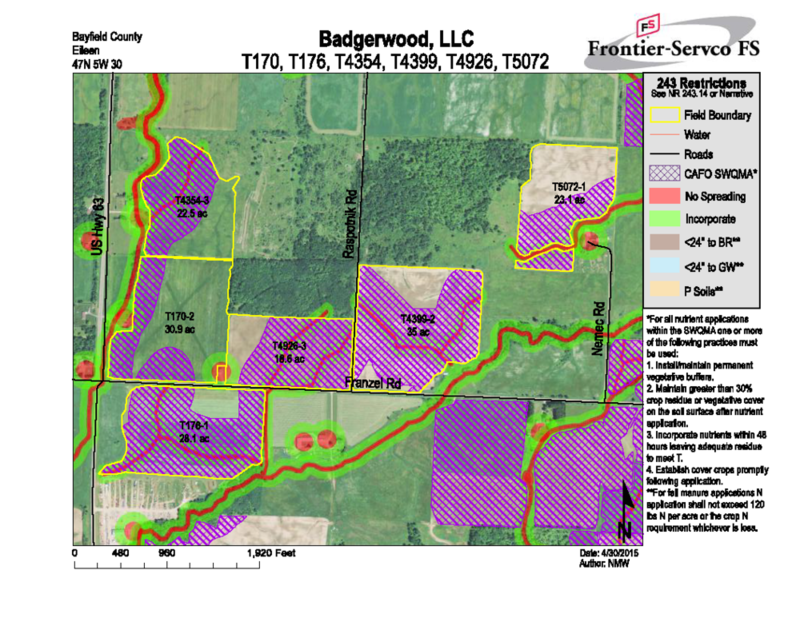 Badgerwood Site Map from Preliminary Application to Wisconsin DNR. Click image to enlarge. Though there may have been merit historically to exempting the agricultural sector from basic environmental protections, the justification for this exemption does not apply to the current realities of industrial livestock production—especially when it comes to the needs of directly affected communities and citizens. With no resemblance in method or scale to family farms, industrial farms masquerading as family farms continue to claim the rights to these exemptions. Under pressure from the industrial farming sector, state legislatures have undermined local residents’ attempts to regulate industrial livestock operations, effectively taking away their democratic right to control what is happening in their own communities. See the article State Preemption of Local Control Over Intensive Livestock Operations by Nadia S. Adawi, published by Environmental Law Institute, Washington, DC. According to the DATCP (Department of Agriculture, Trade and Consumer Protections) website, "The Livestock Facility Siting Law consists of a state statute (s. 93.90) and administrative rule (ATCP 51) that establish state standards and procedures local governments must use if they choose to require conditional use or other permits for siting new and expanded livestock operations...The statute limits the exclusion of livestock facilities from agricultural zoning districts." Local communities have extremely limited control over livestock facility siting when the facility has 1,000 animal units or more. Counties or townships are restricted in their ability to enact any standards that are more restrictive for siting (locating) a factory farm than the standards outlined in ATCP 51. For more information on how ATCP 51 affects local communities, please click the arrows to view this slideshow from Midwest Environmental Advocates. In addition to ATCP 51, for all facilities with 1,000 animal units or more (AU calculator here), the Wisconsin DNR requires a WPDES (Wisconsin Pollutant Discharge Elimination System) permit. The DNR may designate a smaller-scale animal feeding operation (fewer than 1,000 animal units) as a CAFO if it has pollutant discharges to navigable waters or contaminates a well. It's important to note that CAFOs are a self-regulating and self-reporting industry; typically the DNR staffer will visit the facility once every four years, when the WPDES permit comes up for renewal. Ken Johnson, who heads the DNR’s water division, told WisconsinWatch.org that the agency relies heavily upon self-reporting and citizen complaints when it comes to water quality and degradation. 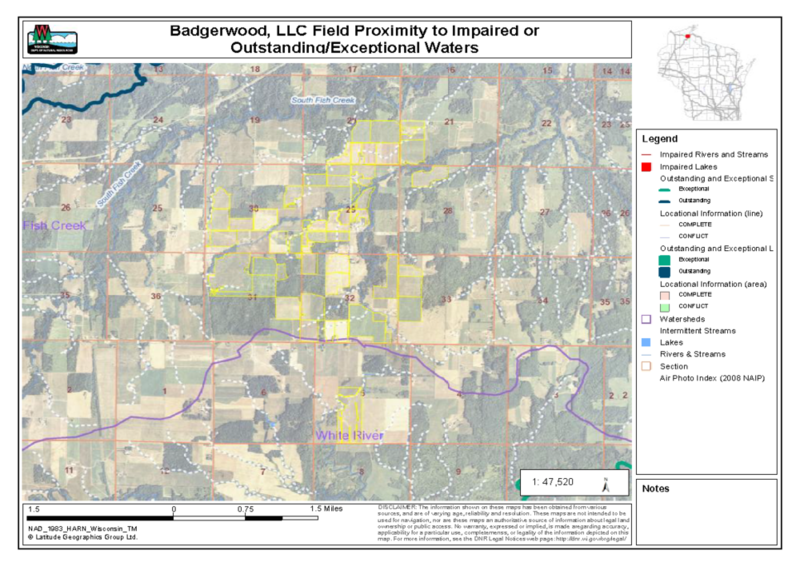 SWQMA (Surface Water Quality Management Area) maps from Badgerwood LLC Nutrient Management Plan (NMP) Revised 4-30-2015. Click on an image above to enlarge; hit escape to return. that our county boards—and our other local government bodies—take action to protect our area! We must Help and encourage them to use all the tools that are available to them! It is also why all of us must let our voices be heard at the state and federal levels! Please check out How Can I Help? above. Get in touch with us today! And make sure all your representatives know how you feel—please keep in contact with them throughout this effort to protect our region.